Toshiba Corp. created the idea of Smart Community, a smart social infrastructure using information and communications technology (ICT) to deliver healthcare, heating, lifestyle, power and water solutions to the global community and promote the use of renewable energies. To advance its initiative, Toshiba required a more flexible, scalable cloud solution capable of supporting a wide range of complex projects. 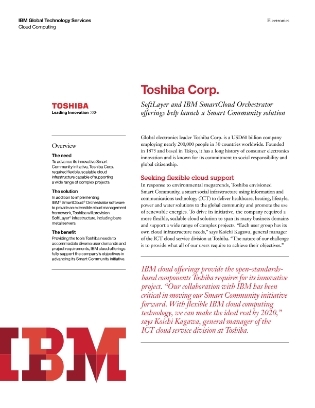 This whitepaper highlights the cloud software Toshiba implemented to provide an extensible cloud management framework.